Lube, Oil and Filter change. Up to 5 quarts of conventional oil. Includes Transmission, Coolant, Brake Fluid, Power Steering, and Differentials. 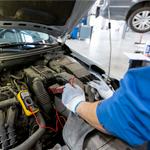 Free battery test on most vehicles.